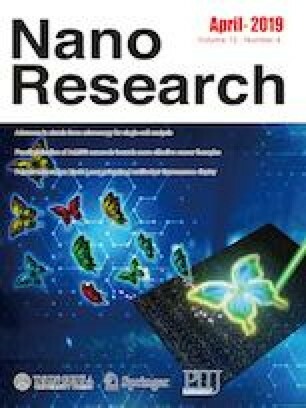 The application of novel methodologies to the synthesis of nanomaterials is still a challenge in many different technological and scientific fields. New efficient and reproducible synthetic methodologies, that produce fewer residues and reduce the cost of raw materials must be developed. In the present work, we have explored the attractive possibility to apply the cheap iron (II) sulphate salt in the reduction process of the K2PtCl4 to produce colloids suspensions. The synthesis took places in water and was assisted by sodium citrate (SC) using polyvinylpyrrolidone (PVP) as a surfactant. 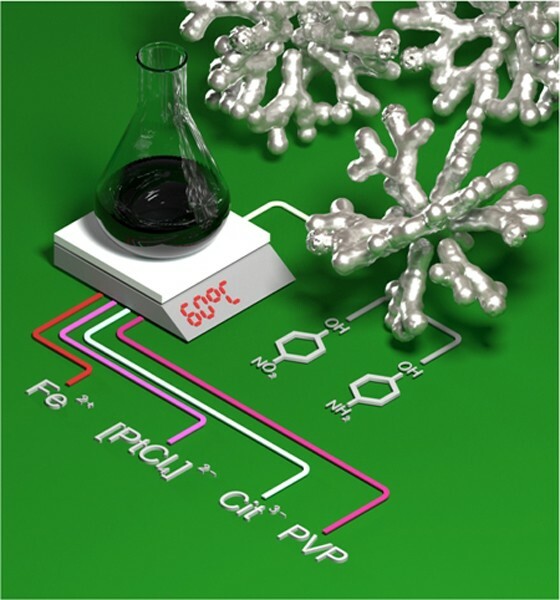 The adjustment of this novelty process allows obtaining well-dispersed and sub-20 nm dendrimer-type platinum nanoparticles (Pt D-NPs). The nano-dendrimers produced have been characterized using dynamic light scattering (DLS), transmission electron microscopy (TEM), high-resolution TEM (HR-TEM), XRD spectroscopy, inductive couple plasma (ICP) analysis, Fourier transform infrared (FT-IR) and ultraviolet-visible (UV-vis) spectroscopy. Interesting conformational results derived from the size and shape will be discussed. Catalytic application of the Pt D-NPs has been explored in the reduction of p-nitrophenol (p-NP) to p-aminophenol (p-AP) in aqueous media at room temperature obtained TOF value of 253 min-1. Finally, our Pt D-NPs were tested as artificial metalloenzyme showing catechol oxidase activity for oxidation of L-DOPA. Supplementary material is available for this article at https://doi.org/10.1007/s12274-019-2350-7 and is accessible for authorized users. David Lopez-Tejedor and Carlos Perez-Rizquez contributed equally to this work. We thank the financial support by the PROTEOMASS Scientific Society (Portugal) (General Funding Grant, as well as the Associate Laboratory Research Unit for Green Chemistry - Clean Processes and Technologies - LAQV-REQUIMTE financed by national funds from FCT/MEC (UID/QUI/50006/2013) and co-financed by the ERDF under the PT2020 Partnership Agreement (POCI-01-0145-FEDER - 007265). J. D., C. L., J. L. C., A. F. L., and J. F. L. thank the FCT-MEC grant (PTDC/QEQ-MED/2118/2014). A. F. L. acknowledges the PhD grants from (FCT-MEC) (Portugal) SFRH/BD/52528/2014 and J. D. thanks the PhD grant associated to the FCT grant PTDC/QEQ-MED/2118/2014 from the (FCT-MEC-Portugal). J. F. L. thanks FCT/MEC (Portugal) SFRH/BPD/93982/2013 and FCT-UNL for the DL57/2016 Assistant Researcher Contract. The authors thank the support by the Spanish National Research Council (CSIC) (CSIC-PIE 201880E011) and we also thank the Ministry of Education, Youth and Sports of the Community of Madrid and the European Social Fund for a contract to C. P-R. (PEJD-2017PRE/SAL-3762) in the program of Youth Employment and the Youth Employment Initiative (YEI) 2017.